Perfect For Halloween Costumes, Birthday Parties & Everyday Play! Pixel Perfect Pink Light Up 8-Bit Swords! Cosplayers and nerds alike, time to celebrate the Holiday Season the gamer way! 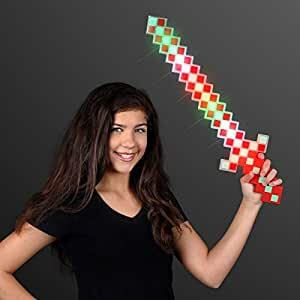 8-Bit Light Up Toy Swords are pixel perfect for… Video Game Trade Shows, Halloween, Cosplay, Convention After-Parties and more! To activate LED 8-Bit Gamer Swords, remove pull tab & press button on side of handle for 3 light functions: Flash, Blink, Color Change. Dimensions (W x H): 6.3″ x 24″. LED Colors: 2 White, 2 Green, 2 Red. Light Up Pink 8-Bit Swords Pixel Toys include 3 AAA Batteries. Batteries are replaceable. NOTE: This is a set of 3 Pretend Play Swords.